Langston Hughes penned this and other poems in the wake of the Scottsboro case; the legal lynching that supported the indisputably false claims of two white women who alleged that they were gang raped by nine black teens onboard a Southern railroad freight train headed from Chattanooga to Memphis in 1931. Despite flawed eye-witness testimony, contrary medical evidence, and the sworn testimony of Ruby Bates, one of the accusers, that she had never been raped let alone touched or even spoken to by any of the defendants, the trials proceeded with guilty verdict after guilty verdict being handed down by all white judges and juries. Altogether the Scottsboro Boys as these young men came to be called spent years of their lives in Alabama prisons experiencing first hand the horrors of the American prison system and Jim Crow justice. Being innocent was as inconsequential then, as being young, black and alive is today. In 1931 it took twelve days for the Scottsboro Boys to be accused, arrested and on trial for their lives, and they were innocent. Yet it took forty-six days for George Zimmerman to be arrested and charged with killing unarmed Trayvon Martin. 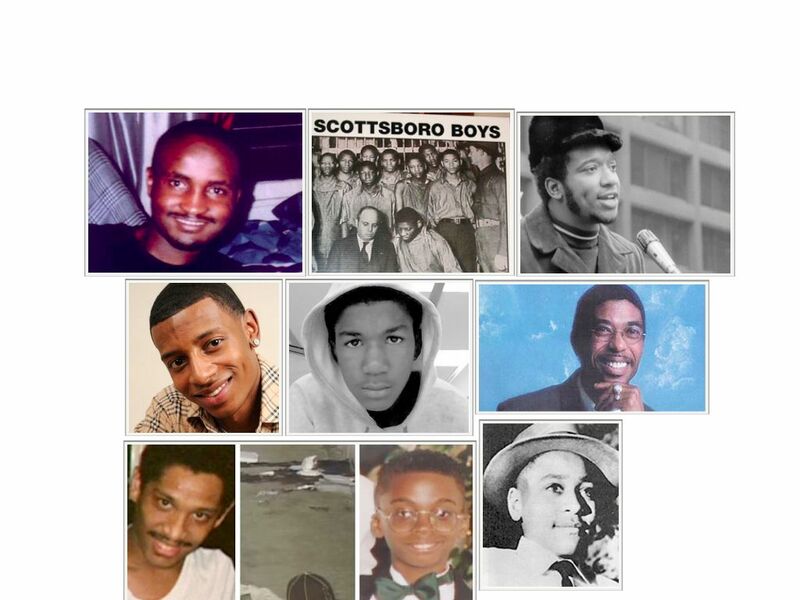 So as supporters and mourners, pundits and politicians discuss the charges of second degree murder against George Zimmerman, I am reminded about those who came before him, the murderers who beat, bludgeoned and drowned Emmett Till; the accusers who sent innocent boys to jail and defamed their character to protect a lie; the badges and bullets that recklessly smoked out the lives of DJ Henry, the Danziger Bridge victims, Amadou Diallo, and Fred Hampton; and the miscreants who hunt and kill black people for sport. I am reminded that our life upon this earth is but a breath and that for many in black America this is a bare life. It is a life lived in juvenile detention halls, prison industrial complexes, urban and rural ghettos, underfunded schools, public housing projects and low paying jobs. Spaces set outside of the political/moral life of the larger society . And this bare life subjects us to modes of violence that are steeped in the middle passage, the plantation economy and the Fugitive Slave Act. You see every generation that comes of age in America has to unlearn these legacies, least they be doomed to repeat them over, and over again. As the mother of a son, a black boy, I am reminded that he will one day be 17, 18, and 19 years old. That he will one day walk down a street, perhaps alone, and so to me the President’s comments don’t seem so strange. What is strange to me is that many would rather focus on the bounty placed on George Zimmerman by the New Black Panther Party, or question black-on-black crime statistics rather than the fact that Trayvon Martin was not the first nor the last victim on this list. I am sorely reminded of the irony, that statistically many young black people have the same if not fewer life chances in an emancipated, post-civil rights, supposedly post-racial America than their ancestors did in the aftermath of the Civil War (more). Finally, I am reminded in my closing thoughts, that this list is incomplete. That there are hundreds of other names, victims of violence, men women and children who suffered not because of what they said, or did, or wore but because the color of their skin so incited others to violence. Hughes, L. (1956). I Wonder As I Wander: An Autobiographical Journey. New York, NY, Hill and Wang. Alexander, M. (2010). The New Jim Crow: Mass Incarceration In the Age of Colorblindness. Jackson, Tenn, The New Press. Thanks for sharing your deep thoughts on this situation. It summarizes much of what we are all feeling and the facts speak for themselves. Your list hurts me. The fact that your list is incomplete hurts me more. Obama only said what every single Black person in this country was already thinking. Orlando Patterson said that slavery is social death. He never accounted for the fact that *literal* death is the constant underpinning of supposedly post-abolition Black life. Here. In Brazil. In Puerto Rico. Everywhere that we watered the soils of prosperity with our sorrow, tears, and blood — it’s the same. « Does a writer have time to blog? You are currently reading A few words on Trayvon Martin at The Prude Papers.